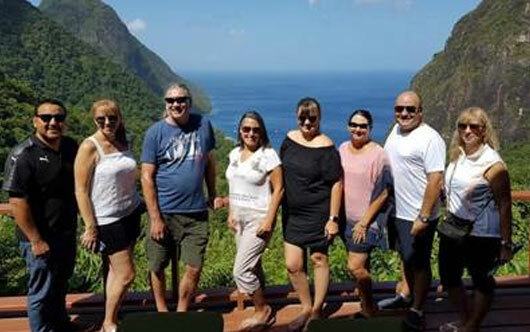 The Saint Lucia Tourism Authority recently hosted a luxury familiarization trip to the destination from Aug. 12-19 with seven top performing Canadian agents from Travel Only Presidents Club. All participants were top producing “Saint Lucia Expert” (SLEx) agents, which reported their Saint Lucia bookings. SLEx is an innovative online educational and loyalty program designed to engage travel agents and serve as their central source for all resources that will enable them to sell Saint Lucia. Led by Rod Hanna, SLTA – trade sales manager, the seven-day luxury fam was tailored specifically for travel agents, allowing them to experience Saint Lucia’s luxury collection first hand, in addition to visiting iconic sites like, Sulphur Springs and Pigeon Island.